The perfect pre-dinner snack, afternoon snack, mid-morning snack – the perfect snack full-stop! I could seriously eat gyoza every day of my life and not get bored with them. I’m completely in awe and amore with the silky noodle casing, fragrant filling and crispy grilled edge. Absolute perfection. Needless to say the gyoza I ate in Japan was the best I’ve ever had! Luckily there was a wonderful place just around the corner from our hotel in Ginza called Chinmaya that served big frosty glasses of beer and a gorgeous version of those little parcels of gyoza joy. I don’t normally drink beer, but it really is the perfect accompaniment to gyoza, and Japanese food in general. That is, if you don’t want to get scarily drunk on sake! Ginza is a very ritzy area of Tokyo. Its wide main street is full of designer shops and sleek bars packed with people late into the evening. We loved staying in this part of town as it’s a perfect base to explore Tokyo. There’s a choice of metro lines and lots of great places to eat. Saying that, we never had a bad meal in Tokyo and we ate Japanese food about 95% of the time. We heart Japan. Big time. Chinmaya is actually a Japanese chain and they also serve big bowls of delicious Tantanmen and Mabodofu. Although the best version of those dishes we had was a few blocks away, hidden in a side street, in Kyobashi. I can’t remember the name of it, but it was our very first meal in Tokyo and I accidentally left the camera in our hotel room. Of course it turned out to be one of our favourite meals of the trip and I don’t have any photos! Tantanmen: soba noodles in a deeply savoury and spicy broth topped with minced pork and a few greens. It’s a completely intoxicating combination that has you wishing the bowl would never end. Mabodfu: silken tofu and ground pork in a spicy sauce served with rice (presumably to cool your tongue!). Both dishes were very spicy but not so much that we couldn’t handle it. We love chilli. I’m so sorry I don’t have any photos! If you click the red links of the dish names above they’ll take you to a flickr photo of what they look like. 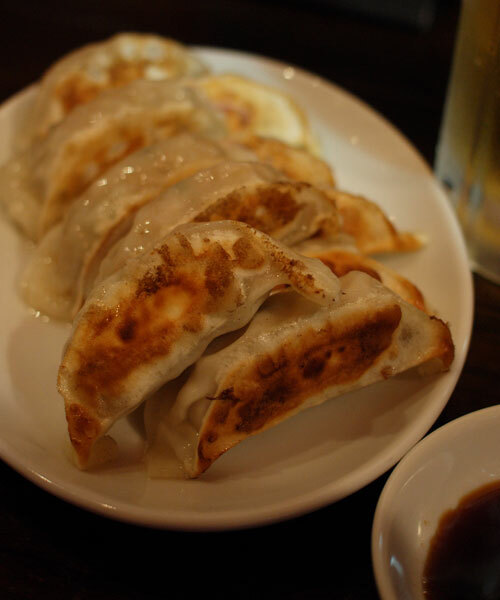 Gyoza are the best…I agree! 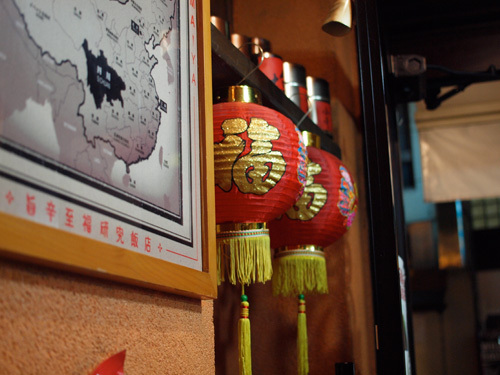 And I also agree about eating in Japan…I’ve had some of the best meals there! Is that kinda like a potsticker. ’cause I love those!!!! 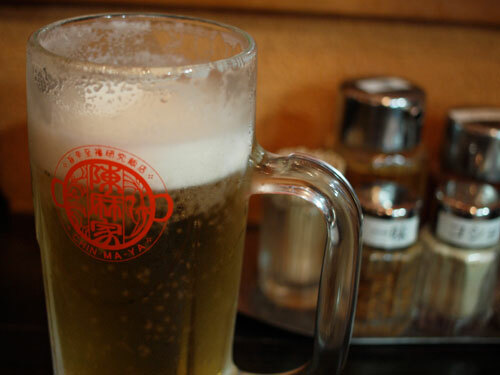 I love all dumpling like things…I didn’t know you’re a beer drinker? Yay I’m so glad to see more Japan posts! I love the crispiness of gyoza when they’re freshly fried. Looks like you scored some wonderful dishes while there. I think forgetting your camera, or missing a shot, really enhances your memories, so maybe it’s not such a bad thing after all. Woo hoo for all us gyoza lovers! @Nina – yes, they’re like potstickers.